It has been a strange month for me. It began slowly which allowed me to make up a couple of batches of walking canes, finish off the ongoing stair spindle job and make up a few small orders that drifted in. It was slow enough in fact, that I even got round to fixing an antique chair for my best mate, which had been upstairs in the workshop collecting dust since well before Christmas. I had promised to fix it 'when I got a chance' and until last month, I just hadn't had the time to do it. Despite the slow start the jobs came in and, by the end of the month, I was working six days a week with several 12 hour days, just to get the orders out by their deadlines. It never rains but it pours, as they say. The work that came in this month was mostly point of sale display components which, unfortunately, aren't very exciting or dynamic to photograph. However, they are quite profitable, which is good for the bank balance, but not so good for magazine articles. When things are slow it can be worrying, especially if the phone stops ringing and the emails are nothing but junk. I wasn't overly concerned this time, though, as there were still a good few enquiries and jobs to quote. I have touched on the difficulties of quoting before, but once you get the hang of it, it's not so bad. One thing I have found is that you need confidence to price properly otherwise you can find yourself working for nothing, but it can be frustrating at times. An example of this happened to me last month. 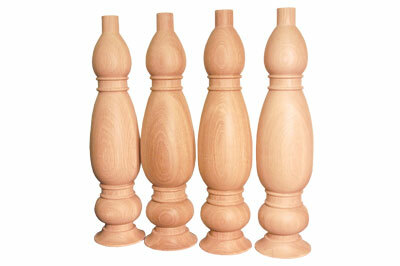 A lady emailed me asking for a price to make a replacement oak (Quercus robur) finial for an antique piece of furniture. 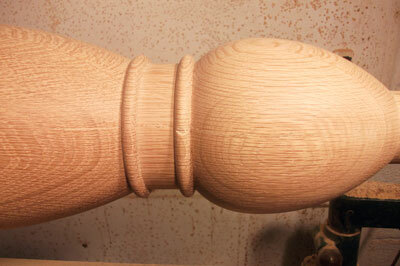 The finial was not very big and it would probably have taken no more than 15 minutes to turn but I would also have had to stain and polish it to match. I figured that if I charged for an hour then I was probably being generous, so I quoted for an hour's work at my standard rate, plus postage. Despite telling me that she was unable to source a finial anywhere, this price was too much. I find it a little frustrating that people will pay their car mechanic or the guy that fixes their boiler - both of which I have had recent experience with, and both charge more per hour than me - almost without question, but won't pay for a quality job that requires arguably more skill. Although small jobs are often more interesting it is the larger production runs that pay the bills. When an enquiry comes in for this type of work there is usually a CAD diagram and probably a request for a price for 1, 50 and 100 pieces. The quote goes in and nine times out of 10, the job comes back because there really aren't that many turners out there that want this type of work. I am lucky that I enjoy the process of turning, so I don't really mind if I'm making a replacement antique finial, 30 oak domes for a shop display, or 100 stair spindles, but some simple maths will tell you which my accountant prefers! 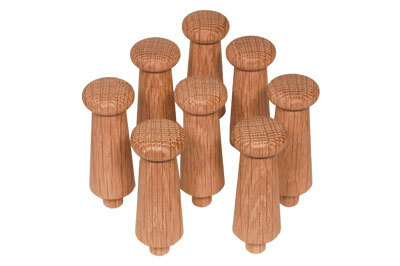 The list of components I turned last month includes oak domes for hat stands, tulip columns for a decorative clothes rail display, oak discs for tape dispensers, softwood domes for a different hat stand, dome finials for a mannequin bust, oak coat pegs and some walnut (Juglans nigra) poles for another clothing display rail. The walnut poles were, on paper, a fairly simple job. There were two sizes, 1,700mm (67in) and 1,425mm (56in), finished at 51mm (2in) diameter with the ends turned down to fit into some chrome fittings. Out of interest, I experimented with the sliding carriage that I described last month but found that there was too much vibration and it was much quicker to turn them by hand. All was going well, the job had gone pretty much to plan and I was just checking them over to make sure they were ready to go out. I test fitted the chrome parts and found one of the longer poles was a little tight, so I popped it back on the lathe to adjust the fit. One of the first things we learn when we start turning is that you should always start each job with the lathe speed slowed down and build it up until it is correct for the job in hand. As you get more experienced you can gauge what the correct speed is, although usually erring on the side of caution. Between taking the pole from the lathe and remounting it I had done another little quick job at high speed, but forgetting this, I started the lathe up with the 1,700mm (67in) long pole held between centres at 1,850rpm rather than the 750rpm that I had been working them at. The result can only be described as spectacular and more than a little scary. As the pole spun it began to flex in the middle and whip - a little like a skipping rope does as it spins - and it flexed so much that it came away from the revolving centre in the tailstock and I ducked just in time for it to go flying over my shoulder and rattle against the back wall of the workshop. Amazingly, the only thing damaged was my pride and there was a tiny dent in the pole which easily sanded out. A reminder that, although lathes are probably one of the safest machines in a workshop, they still need treating with respect. Take care. As usual, as my workload increased I had several demos to do. I've said before how much I enjoy doing my demos but why do they never happen when I have less work? Very strange. I seem to be travelling further afield to demonstrate these days and of the four demos I did last month, two were long distance and both in the same week. The first was to Merseyside on a Tuesday evening. This was held in a pub and was the first time I have been offered a 'proper' drink at a demo; normally I am happy for anyone to buy me a pint but before a demo with a long drive home? I decided against it. The second was in Snainton, near Scarborough, on the Thursday and the two together totalled nearly 600 miles. Tiring but enjoyable, made even more tiring when you have a 14-month old at home who likes to wake up a couple of times a night, just to remind us of his presence! 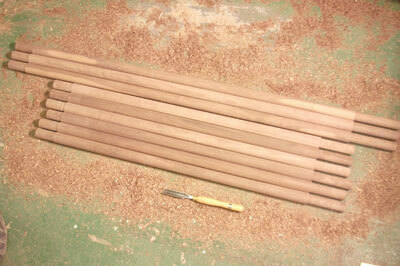 You may remember that I made a set of large legs in laminated oak for a client some months ago on my Jet lathe. I have since turned several more sets but havenâ€™t had the space to write about them. Once again, the client came back to me and asked for four more, this time to a slightly different design. 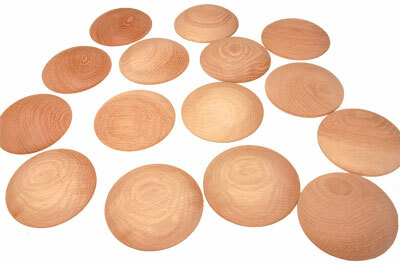 They still needed laminating from four pieces of 50mm (2in) oak and were to be finished at 700mm (28in) high. The job went well until I was turning the last leg. 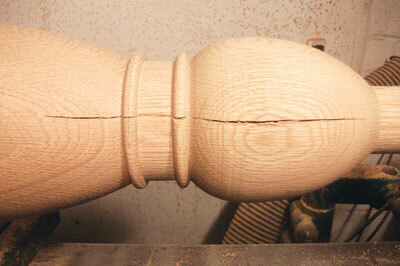 I was almost finished when I stopped the lathe to check it over and found, to my disgust, a crack had opened up along the lower quarter of the leg. I had several options for the oak legs at this point: I could bin it and start again - but that meant a whole board of oak going to waste and the customer certainly wouldn't pay for it - so I didn't much like that option. 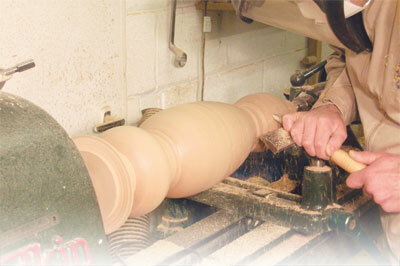 A proprietary filler is fine for wood that is being painted but would show up like a sore thumb on a polished oak leg. I decided the best option was to try and repair it; I could always fall back on option one if I had to. I cut a number of thin slivers of oak and squeezed plenty of glue into the crack, then carefully tapped the slivers in with a small hammer, leaving it to dry for an hour or so. I removed the excess with a sharp chisel and sanded the leg. On inspection I was pretty pleased with the outcome; I could hardly tell it was there, so I was happy to send the legs out.